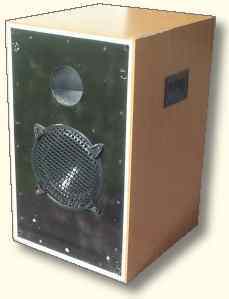 The "Beer Fridge" was my first subwoofer and was nothing fancy. Using Jaycar's 80W amplifier it performed quite well but the single port was a bit noisy when pushed hard. The single 100mm port keeps Air Velocity below WinISD's recommended limit of 17 m/sec. The ends of the port were hand sanded for a flare of approximately 5mm, which was not sufficient to prevent "chuffing". This could have been avoided had Flare-it been available at the time. The grey line indicates actual velocity and the blue line shows where audible noise occurs. At full power, "chuffing" is indicated between 20hz and about 32hz. It's funny how the wheel turns. This sub was bought by a friend, which financed the next one. Several years later, we did a deal on a better box (see the Slim-Jim project), and I was left with this enclosure. After removing the port, the size was 100 litres, which is perfect for use in round two of my Flare testing experiments.